As noted by many neighbors, it got a lot more difficult to park on the block recently. Due to construction staging on 66th Street, ABC’s press parking was relocated to the 67th street side of their recently sold campus, joining their many curb cuts for loading docks and production staging. Renovations closer to the park have also assumed six spaces for dumpsters and remote HVAC systems. The WEST SIDE RAG details the parking situation noting that 18 public parking spaces were taken for re-assignment. A view of the block this morning shows mixed compliance but a dominance of NYP plates. The construction project on 66th Street filed its Zoning Diagrams in late July. LANDMARK WEST! has joined with neighbors and will be filing a Department of Buildings Challenge before the September deadline arrives. Lost parking is just one of many impacts to be addressed as foundation work continues on the combined sites of the former ABC storage buildings, Congregation Habonim and the Jewish Guild for the Blind running through block 65th-66th Streets. 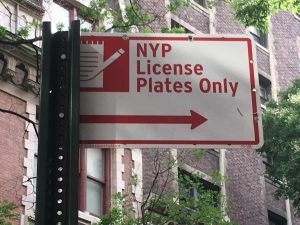 The construction on 66th Street is scheduled for completion in March of 2019…while that is a most aggressive schedule it will mean at least another seven months before parking returns to normal.